I’d write with my feet. Writing with your tongue sounds painful and unbearably slow. Unless you interpret “writing with your tongue” as dictating or using voice transcription software. Then I would do that. A long string of moderate sellers. Ideally I’d like longevity and a steady or growing readership. What comes after the one giant bestseller? Vain attempts to publish another? Retirement? I’d prefer to be in it for the long haul. A well known author now. Once you’re dead, you’re dead. You don’t get to share in the experience. I’d be okay with not using conjunctions. The prose would be a little stilted but still readable and after a while you wouldn’t notice. Making every sentence begin with a conjunction would be annoying, for both the reader and me. I’d get the tattoo. That actually sounds pretty cool. I like the idea of having the words physically imprinted on me. I would prefer that over the audio, which would be distracting and become irritating after a while, lessening my love for the novel. Definitely a plot twist. My characters drive my writing, and I become deeply committed to them. Even when I don’t like what they’re doing, I still have a deep affection for who they are. It would be hard to live with a character I outright hated. I’ll say my blood as ink. There’s a gothic romance to it that appeals to me. I see candlelight, a blood filled inkwell, a quill pen. I’d have my characters escape the page and reenact the novel in real life. Even if I never met or saw them, it would be deeply satisfying to know they were out there, doing their thing. I like my own life too much to want to give it up to go live in my novel. Giving up punctuation and capitalization would be less limiting, but I like the challenge of giving up E. For a short story, I’ll write without E. For a novel, I’ll forgo punctuation and capitalization. I’d rather schools teach my book. A banned book may push more boundaries, but a book read in school has more direct opportunity to make an impact. Angry Dylan Thomas, I could endure. Ayn Rand would be pure torture. If I have to be limited by form, I’d rather be limited in speech. Speaking in haiku sounds fun, a new artistic avenue. I’ve always been a shy speaker, so maybe the parameters of haiku would create a sort of freedom, a speaking identity. 50 Shades. At least it would provide some amusement. I’d rather be read and ripped than never read and never discussed. Criticism means your writing has had an effect. Whether good or bad, your words did something. Twitter. At times the tweets might be embarrassing, but people’s feeds get so crowded that much of that would be lost in the shuffle. I like to be alone with my thoughts, so having a voice narrate my every move would be oppressive. Pens and paper. I do most of my writing on the computer. Lying down. Standing on my tippy-toes for an entire novel would get painful and distract from the work. I’d prefer to read naked. I could turn it into performance art, and being seen naked isn’t a terrible thing. I mean, we’re all naked under our clothes, right? But facing an empty room—that’s depressing. I go back and forth on this one, but I’ll say I’d rather read a book that’s poorly written but has an excellent story. Pretty sentences or interesting structure will only sustain you for so long, but a compelling story will keep the pages turning, even if the prose is unlovely. I'll go with writing a synopsis or essay about the prospective audience. As time-consuming and soul-sucking as those can be, they won't give you weird diseases. 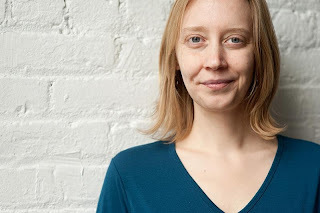 Courtney Elizabeth Mauk is the author of the novel Spark (Engine Books, 2012). Her work has appeared in The Literary Review, PANK, Wigleaf, and FiveChapters, among others. She is an assistant editor at Barrelhouse and teaches at Juilliard and The Sackett Street Writers’ Workshop. She lives in Manhattan with her husband.